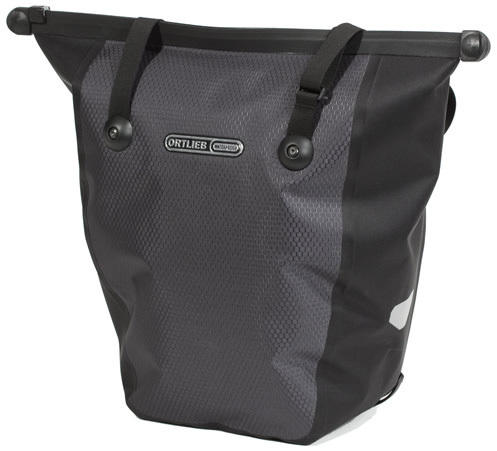 Riding to the store or commuting to work just got easier with the Ortlieb Bike Shopper Pannier. It is a waterproof shopper bag that mounts on your rear rack like a regular pannier but features convenient carry handles for shopping. The bag features a removable, zippered, interior pocket for small items, an adjustable shoulder strap/carry handle that is made from strong nylon webbing, welded seams and coated fabric that ensures the contents inside stay dry, and a locking slider closure that closes tight and secures the bag. The outside of the bag features front and rear reflective patches that provide low-light visibility.